In Case of Emergency *ICE* is a program that enables first responders, such as paramedics, firefighters, and police officers to identify victims and contact their next of kin to obtain important medical information in the event of unconsciousness. Many smart phones have a place where you can input and store your I.C.E. information, but it often a good idea to keep this information on a dog tag in a safe place (around your neck, on a bracelet, on your keychain, in your purse or wallet, etc.). Another idea is to create an I.C.E. tag to attach to your child's carseat (perhaps with a flush-mount style dog tag). This way, in case you are ever in an accident and unable to communicate, first responders will know your child's name and who to call to assist with the child and medical decisions. 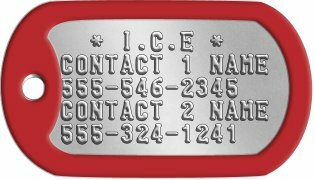 Customize to Buy your I.C.E Dog Tags now! First responders, medics, and doctors are trained to look for a Medical Information tag to alert them of your chronic health conditions in the event that you are unconscious. A brief and easy to read description summarizing a few of your key medical facts can be invaluable to ensure that you receive proper treatment. Special medical identification style dogtags with either an embossed Caduceus "Staff of Hermes" symbol (two snakes winding around a winged staff) or "Rod of Asclepius" symbol (one snake winding around a rod) are fully customizable and are designed to last a lifetime! Although there is no defined format, we suggest that you consider using some of the above medical advice on your tags. Note that no guarantee or warranty of any medical or emergency services is expressed or implied. 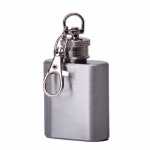 You do not have to rely on only a medical alert bracelet to convey important medical information as first responders are also trained to look for a medical alert necklace. 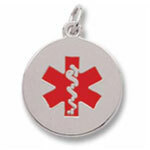 We offer you the choice of wearing your medical tag however you prefer! Choose from a ballchain necklace, keyring, wire cable, even a leather cuff bracelet, or paracord survival bracelet. 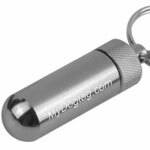 Our fully custom medical ID dog tags and fasteners give you the flexibility to create a medical alert tag that works for your needs. All orders are shipped within 1 business day and are usually delivered within 1 week (in North America). 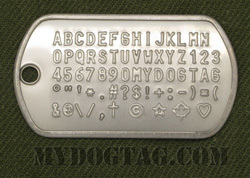 If you need any assistance creating or ordering your I.C.E Dog Tags please contact us directly, we are here to help!